The Northern Knights drew first blood in this season’s Inter-Provincial Cup when they proved too strong for the North West Warriors at Stormont on Monday. Despite being declared unavailable for the game over the weekend, the Warriors received a real boost prior to the contest when Andrew McBrine passed a late fitness test. The Donemana man got the first job right when winning the toss and he had no hesitation in asking the hosts to bat first. Former North West man Chris Dougherty and CIYMS’s Nigel Jones gave the home side a good start and had 52 on the board before the visitors broke through. The openers contributed 32 apiece before Rassie van der Dussen, the Knights’ overseas player, entered the fray and added 22 more. James Shannon looked in good order as he hit 7 fours in his 46 from 48 balls but after that, the Warriors’ bowlers fought back really well. When Shannon was in the middle a total of 250- plus was on the cards. 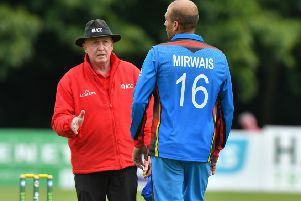 However, Shannon’s dismissal, caught at deep square leg by Barr from a Stuart Thompson short ball, sparked a dramatic collapse, as they lost their last seven wickets for 49 runs. Indeed, it took a late unbeaten 17 from Gary Kidd to get them to 208 all out with five balls of their 50 overs unused. Skipper McBrine (2-24) Craig Young (2-34 including a superb second spell) and Graeme McCarter (2-35) led a spirited showing with the ball while Stuart Thompson and Gary McClintock picked up a wicket each. The Warriors’ reply started patiently: David Barr struggling to 11 before being trapped in front by Peter Eakin. David Rankin had earlier gone the same way to Phil Eaglestone for 6 but Stuart Thompson and Craig Averill batted steadily to get their side back in. This pair, coupled with some wasteful bowling from the Knights took the reply to 74-2 before disaster struck for the North West men. Averill chased a wide one from Eaglestone but succeded only in feathering to Dougherty behind the stumps and one ball later the same combination did for McBrine. Thompson had made 21 before getting one that stayed low to fall lbw and suddenly the home side’s tails were up. There was a sense that Andrew White’ s team were moving in for the kill at that point and when the McClintock twins fell in quick succession, the game was up. The final total was a disappointing 105 all out with Gary Kidd (4-26), Phil Eagleston (3-20) and James Cameron Dow (2-17) doing the damage in what was ultimately a very comfortable victory for a side that is full of talent and attacking threat. The next action in the series is a three-day Championship clash between Leinster Lightning and NW Warriors at Clontarf starting on Tuesday May 12. North West Warriors 105 all out (34.3 overs, Stuart Thompson 21, Gary Kidd 4-26, Phil Eaglestone 3-20, James Cameron-Dow 2-17).